These illustrations were created using Adobe Illustrator. 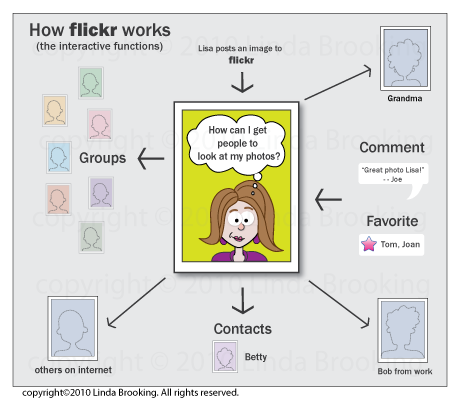 They were created to depict important concepts found in a study: Promoting oneself on Flickr: Users' Strategies and Attitudes. 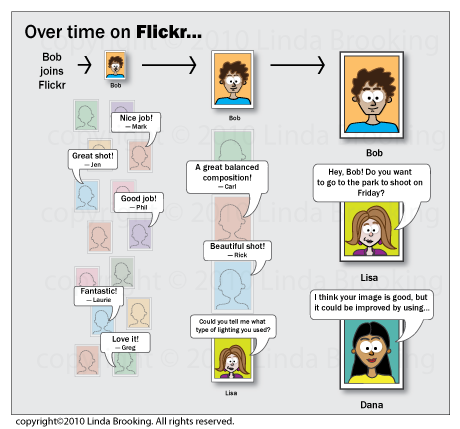 The illustrations were used in a poster which was presented at the Group 10 conference on computer supported collborative work. This illustration is mixed media - both traditional pen and ink and digital media (Illustrator). For ease of process both in creating the illustration and for publication in journals I have moved to creating digital illustrations. The process for creating this illustration involved meeting with the client to identify the most important parts of the plant to be represented. The client then provides samples in which these features are exemplary. Then, using a disecting microscope, I create scaled pencil drawings. I present these to the client to make sure that I have captured the subtlties, make any corrections necessary, and have the client sign off on the sketches. The sketches are then scanned, and imported into Illustrator. This illustration was composed over two separate time periods and lead to the use of two medias. The layout was created based on the publication requirements of the botanical journal Brittonia, as requested by the contracting botanist. The illustration is awaiting publication. For this illustration, the initial drawing was created in pencil, based on a live specimen and photos sent by the client. The sketch was then scanned and then imported into Illustrator and the final product was a digital illustration. The illustration was published in: Madroño July 2010 : Vol. 57, Issue 3, pg(s) 203-208 doi: 10.3120/0024-9637-57.3.203 . 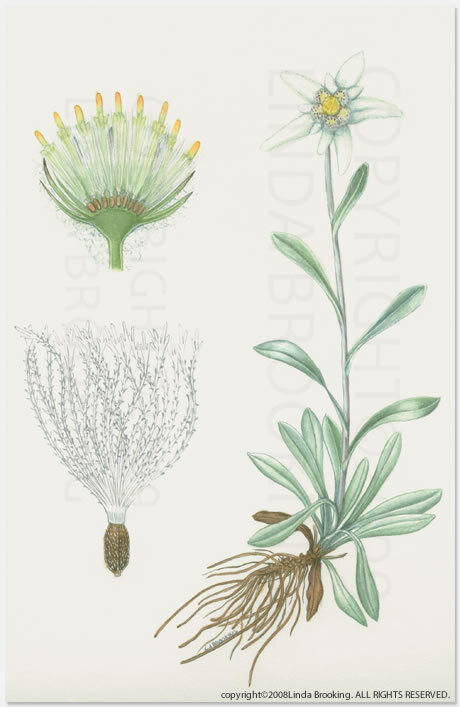 This illustration was created from sketches based on herbarium specimens and images (for correct color). The initial sketch was in pencil, then transferred to watercolor paper, and painted using watercolors. It was a commissioned piece for a personal collection. 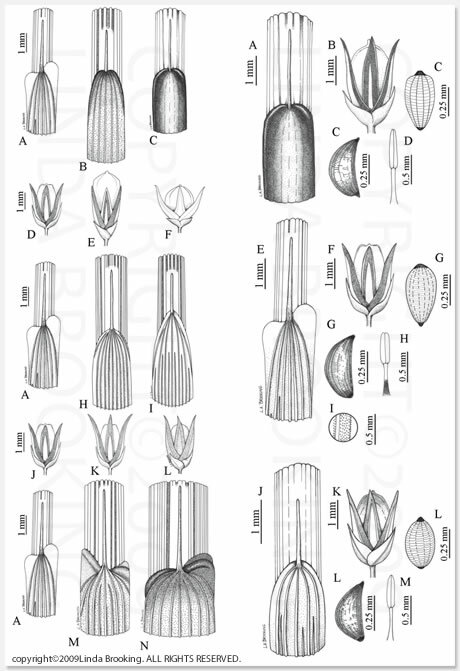 These illustrations were initally created using a dissecting microscope so that the detail on the seeds could be captured for identification purposes. The sketches were in pencil and then each individual seed was transferred to it's own bristol board and inked. 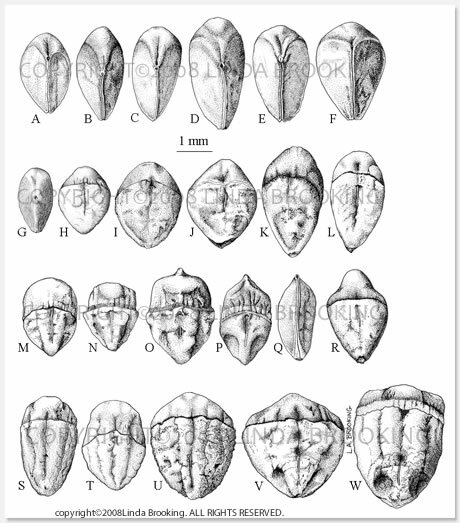 Each of the smaller illustrations were scanned in, touched up in Photoshop, and then a composite image was layed-out in InDesign according to journal publication specifications. This composite was contracted by a botanist for publication in a scientific journal. For this illustration the contracting botanist wanted to describe a new prunus hybrid in comparison to both of the parents. Both live and pressed specimens were used to create this illustration. A dissecting microscope was used for examining the smaller features. Individual sketches were made of each feature using pencil and were then inked in on separate sheets of bristol board. 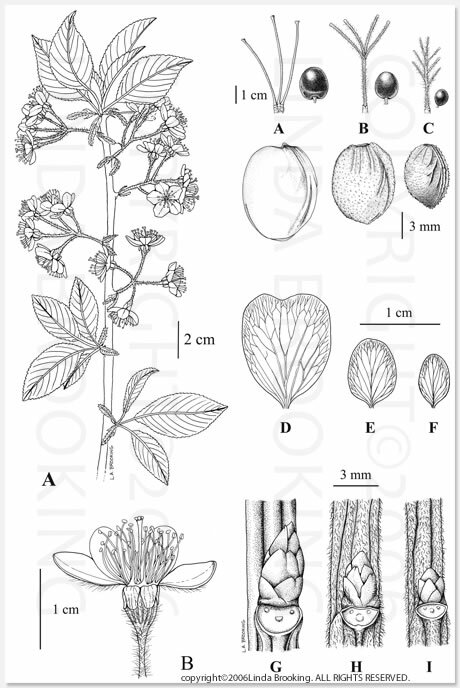 All inked illustrations were scanned into Photoshop, adjusted, and then a composite layout was created in InDesign according to the botanical journal, Madroño. The illustration was published in Madroño 54(1): 74-85. 2007. 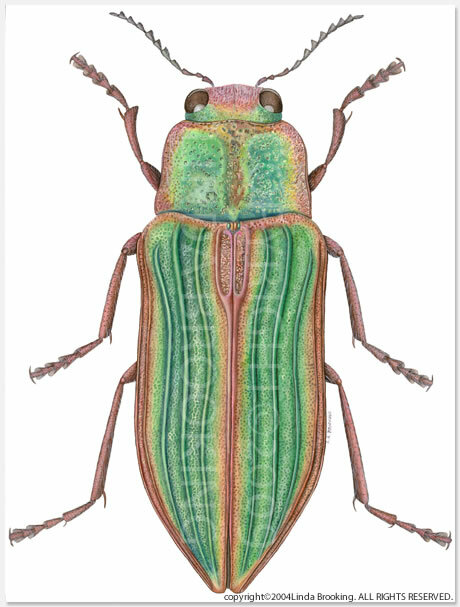 This illustration was created using a specimen and photos (for accurate color). 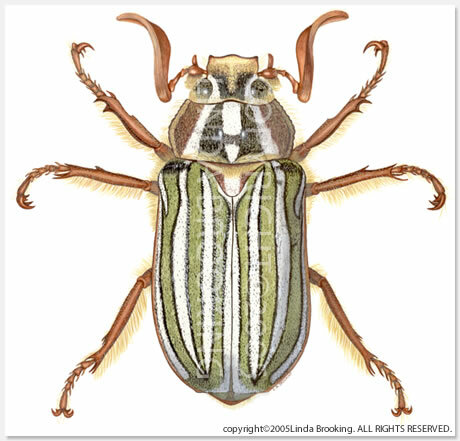 An initial pencil sketch was made of the beetle and this was transferred to watercolor paper and painted using watercolors. The illustration was a commissioned piece for a personal collection. 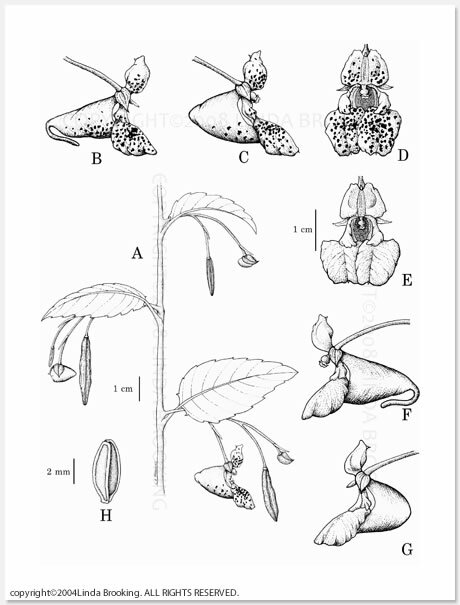 For this illustration the contracting botanist wanted to describe a new impatiens hybrid in comparison to both of the parents. 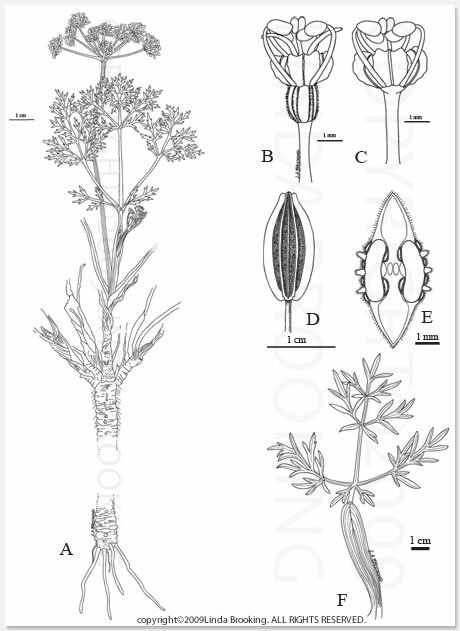 Both herbarium specimens and the botanist's photos were used to create this illustration. A dissecting microscope was used for examining the smaller features. Individual sketches were made of each feature using pencil and were then inked in on separate sheets of bristol board. All inked illustrations were scanned into Photoshop, adjusted, and then a composite layout was created in InDesign according to the botanical journal, Novon. The illustration was published in Novon 16(3):444. 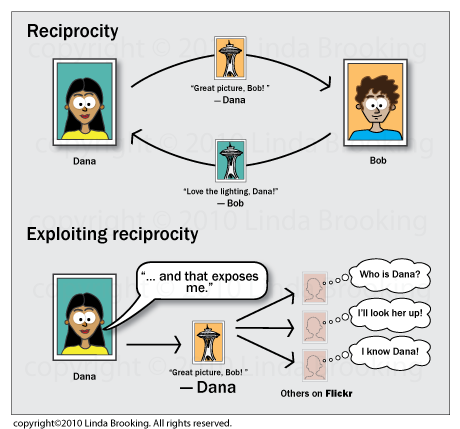 2006.
copyright © 2013 Linda Brooking. All rights reserved.